Covering the Tipton area, C Pages Web Design is based 3 miles from the centre of Birmingham in the West Midlands. Our Birmingham based web designers offer an affordable website design service to predominantly small to medium sized Tipton businesses looking to tap into the benefits of promoting their businesses over the Internet. C Pages offer both local and national search engine optimisation for businesses in the Tipton area wanting to grow their internet enquiries with prominent website listings in the major search engines including Google. Here are a few examples of some of the websites we have completed for our clients in the Tipton area. Door Springs Ltd is the country’s leading manufacturer of Counter balance springs for the UK Door industry with over 30 years experience. 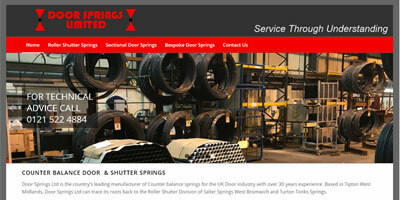 Based in Tipton West Midlands, Door Springs Ltd can trace its roots back to the Roller Shutter Division of Salter Springs West Bromwich and Turton Tonks Springs. 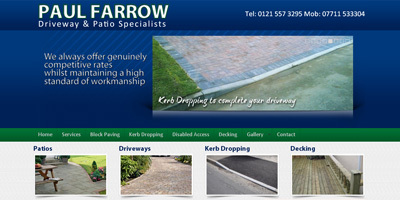 P Farrow Driveways & Patios is a well established family business in the Black Country originating from my Father’s Block Paving business founded over 40 years ago. The majority of driveways and patios work carried out comprises repeat business and recommendations from previously satisfied customers from whom references are available on request. Viewings of work previously undertaken throughout the West Midlands can also be arranged if desired. We endeavour to offer genuinely competitive rates whilst maintaining a high standard of workmanship and a high quality of materials utilised.